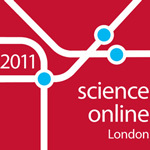 The conference "Science Online London 2011" was held on 2-3 September, 2011, British Library, St. Pancras, London. We can only include talks for which we have permissions and presentation files. If you are an author or moderator and think your session should be here, please email kaveh@river-valley.com. Panel #2: Incentives - "What's in it for us?"